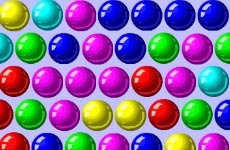 There are many levels in the game and each level of the game is more challenging than the previous one. The lines of colored bricks keep falling and you as a player must click on the pairs or clusters of same colored bricks to make them disappear from the screen earning you points. Depending upon the number of bricks you destroy and the time that you survive, you will be awarded points. Play the game using the mouse of the computer.